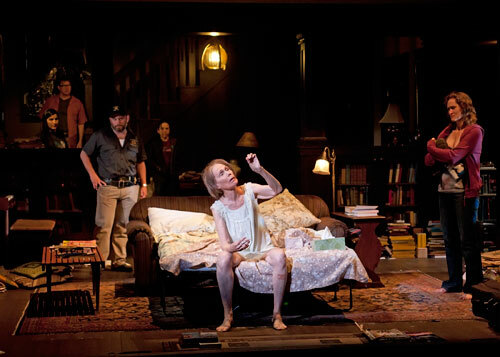 “Incredible” is the first word that comes to mind to describe the Tracy Letts’ play “August: Osage County.” It is, to say the least, an extraordinary piece of American literature to be ranked up with the most popular classics. “Amazing” is the second word, and that’s for the remarkable Old Globe production of the play. It starts with the gargantuan set that swallows and spits out members of the Weston family at will. It is a two-story Midwestern house, topped by an attic. This astounding and practical set, ingeniously designed by David Zinn after a real house he and director Sam Gold found on a research trip to Oklahoma, fills out every inch of usable space on the Old Globe main stage. In many ways the life-size dollhouse reflects most of its residents and guests. Regardless of its outside appearance, the inside is cluttered, messy and imperfect. Is has seen too much and has been scarred through the years. We see the potential of this hall, but the cleanup task would, no doubt, be daunting. A stranger passing by would not see all this, as the windows are taped over with black plastic. But if that stranger hangs out long enough, as we the audience do, he will get a full look inside and will know more than he ever wished about the disarray that reigns in the Weston residence. The Westons, a dysfunctional family reunited after a member’s passing, appear onstage gradually. First, we meet Beverly (Robert Foxworth), the patriarch, and Johnna Monevata (Kimberly Guerrero), a young local Cheyenne woman he hopes to hire for some greatly needed housekeeping. She will also care for Violet (Lois Markle), Beverly’s wife, who is afflicted with several ailments and might prove a bigger challenge than the cleaning and the cooking. Next is supposedly single Ivy (Carla Harting), one of three daughters. The two others are Barbara (Angela Reed) and Karen (Kelly McAndrew). This trio has drifted apart and tries to somewhat reconnect at this impromptu reunion. Barbara came accompanied by her husband, Bill (Joseph Adams), and their high school–aged daughter, Jean (Ronete Levenson). Karen brought her fiancé, Steve (Robert Maffia), who has never met the rest of the Weston clan. To complete the family picture, we meet the archetypal Midwest couple, Aunt Mattie Fae (Robin Pearson Rose) and Uncle Charlie (Guy Boyd), with their son, Little Charlie (Haynes Thigpen). Last, but not least, the sheriff of the town, Deon Gilbeau (Todd Cerveris), is the bearer of not-so-good news. The performance that stands out is by Lois Markle, as Violet. Violet drives the action, and the impact she makes on every member of the family is colossal. She has chosen this gathering to be “truth-telling time”, which of course upsets the usual polite etiquette everyone would like to adopt. Performing this role has to be a very difficult task, considering the complexity of the character, both physically and psychologically, but Markle pulls it off superbly and produces an act of the highest caliber. But what is truly noteworthy is that most of the other performances in this production are first class. The large group of actors has a powerful chemistry onstage, and we never doubt any of the family affiliations. They also exploit every single opportunity for humor (and there is plenty to be found there, despite the serious subject matter) and make this three-hour-long gem of a play go by like a snap. “August: Osage County” is beyond doubt a not-to-be missed theatrical adventure.